A vinyl siding contractor will provide all materials and labor for a complete job, for one contract price. He will have samples of all styles and colors and should provide these to you to make a choice. 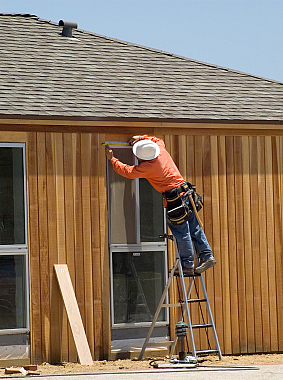 The same contractor you employ to frame the house can install fiber-cement siding. Siding installation cost is figured separately from framing cost. You may, however, combine the two into one negotiated contract price. He will provide labor only, no materials. This labor should include installation of window and door flashing. A stucco contractor will provide all materials and labor for a complete stucco finish. This will not include painting, however. He should provide you with choices of tinting, which you should consider because it will be much less expensive than painting. His contract price should also include installation of flashing.